This troubling 2:1 ratio isn’t unique to the Recession. According to a new report from the Center for American Progress (CAP), “The black unemployment rate tends to be about double that of whites, regardless of the economic climate.” The unemployment rate when the Recession was just beginning at the end of 2007, for example, was 8.4% among African Americans, 2.1 times the rate among whites (4.1%). Source: Center for American Progress, "The Black and White Labor Gap in America," 2011. While the Recession has forced a greater share of African Americans into unemployment (an increase of 8 percentage points versus 4 for whites), the size of the overall disparity has remained the same. Black and white unemployment rates are both about double what they were when the Recession started: the current rate among African Americans is 1.92 times what it was at the end of 2007; for whites the ratio is 1.98. The CAP report provides some evidence that African Americans may be experiencing the phenomenon known as “first fired, last hired” that has been seen in other recessions. White unemployment rates have dropped slightly (by 0.4 percentage points) since the recovery officially began in mid-2009, while black unemployment has continued to grow (up 1.3 percentage points). While all of this data is disturbing, one figure in particular caught my eye. The latest national unemployment number – 9.2% – that has people freaking out? 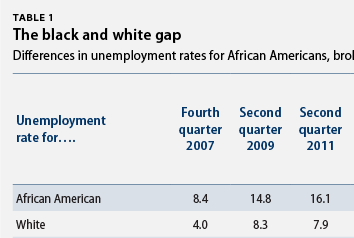 That was the exact unemployment rate among African American men in 2007, before the Recession began. This entry was posted in Unemployment and tagged Race, Unemployment by Diana Brazzell. Bookmark the permalink.